According to BBC, an average person spends almost two hours every day on social media. Social networking sites now have an unprecedented level of traffic. Unfortunately, many businesses have not fully tapped the potential of these networks, this includes e-commerce businesses too. Most businesses aren't fully aware of how to effectively use social networks to bring in customers and prospects. With the ever-growing use of social media, it is evident that to drive an e-commerce business forward one must create brand awareness, engage with customers, understand customer perspectives. How to use social media for your e-commerce business? Not all businesses use social media for the same purpose. Based on the nature and goals of the business, the purpose and method of using social media differs. First, fix the goals that you want to achieve with the help of social media and devise all your methods and strategies based on your goals. Don't always sell. Add value. Businesses tend to mistake that social media is the place only to sell. Though people might decide to buy a product on social media, they don't visit these sites with the intention of buying. Hence, craft your posts in a way that they educate or add value to your audience. Based on the core of the business, goals and user base – the platform should be chosen. Each platform has a different set of users with different purposes. The leading social networks along with its latest features used by businesses are listed below. 95.1% of users access Facebook via smartphones. Therefore it is very important to optimise your posts for mobile phones. 31.8% of users access Facebook via desktops and laptops. People access Facebook at least eight times a day. Hence, schedule your posts based on your target audience’s Facebook usage time. It is also one of the most popular platforms of all. Even after reaching substantial heights, this massive network is still growing. People use Facebook to see updates from their friends, families and celebrities; not posts from businesses. Hence, craft your posts accordingly. ❖ Facebook business page: The first step in Facebook marketing is creating a facebook business page. This is the place where you showcase your business, add products, receive customer reviews, get engagements on your products or posts. But the facebook business page has certain limitations. 1. The organic reach of any Facebook business page post will be limited to the followers of your page. 2. Even among your list of followers, your posts will be reaching to limited followers. Hence, paid advertising is the way forward for you to showcase your business to the large audience (targeted audience). ❖ Facebook pixel: It is a piece of code provided by Facebook which can be used on your website. This code will allow you to measure the effectiveness of ads by understanding the action of visitors on your website. Here is the step-by-step guide from facebook on creating and installing facebook pixel on your website. Once you are done with pixel setup, start Facebook advertising for your business. Conversion should be the only objective. Dynamic ads, Facebook Carousel ads and retargeting ads work better. ❖ Dynamic Product Ads - It is also said to be the highest ROI method for e-commerce business. However, you should have Facebook Shop for this feature to work. ❖ Facebook Carousel Ads - This feature allows you to display up to 10 images or videos in “cards” format in a single ad. Using this feature can give more options to your customers and can also show different features of the same product. Carousel ads have higher interaction rates. ❖ Retargeting Campaigns - We saw how Facebook pixel understands user behaviour on your website. And, some visitors might leave your website without making any appropriate actions due to various reasons such as distractions, poor internet connectivity and so on. You can target the visitors who left midway and bring them back using retargeting campaigns. ❖ Facebook Shop - It is the place where you can sell products using your Facebook page as well as Instagram Shopping catalog. Here is the walk-through guide on setting up your Facebook shop. If you want to learn more about how to get the most out of Facebook Ads, Facebook Blueprint helps you learn the skills to move your business forward. Instagram is the current hottest sensation among all the social media networks. Once you create an Instagram account make sure you change that into a business account. Furthermore, make sure that your product catalog is synced with Facebook Shop. 500 million people use Instagram every day. 60% of users discover products on Instagram and 75% of users take actions. ❖ Influencer Marketing - According to Bloglovin, Instagram is the most effective platform for engaging with the target audience. Users (influencers) with huge followers ranging from thousands to millions can be considered as Instagram Influencers. A comprehensive guide to Instagram influencer marketing by Convince&Convert has a detailed guide to Instagram influencer Marketing. You can check it out. ❖ Strategic use of Hashtags - Use hashtags that are relevant to the particular post and its intention. You can also add hashtags that represent your brand. 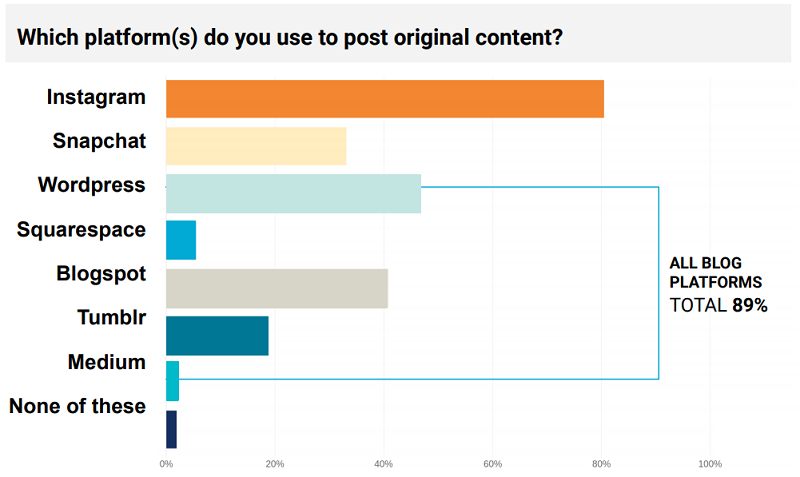 ❖ User-Generated Content - People trust other people, sometimes more than brands. So it is recommended to post user-generated content, this also improves the brand awareness and engagement. ❖ Use Stories - Stories are a better way to reach out to your customers. While your post could be lost in their feed; stories have better chances of reaching them. ❖ Use Videos - Instagram is not just about pictures anymore. With the release of IGTV, it is obvious that Instagram wants enterprises to leverage storytelling in video format. ❖ Photos with right sizes and same patterns/filters - Businesses have a common background to which they add their content; the common background includes – logos, frames and many more. Filters can make the photos appear better. Using the same background or style might help customers to recognize the brand easily. HubSpot’s 30 Days of Instagram helps you in building an effective Instagram strategy. Twitter is a simple yet effective platform to engage with customers. The character count for each tweet has increased to 280 characters from 140 characters. This can be useful for businesses to convey their messages easier. It is one of the few platforms that can help companies to reach both individuals and masses. Twitter has 330 million monthly active users. Reports indicate that 41% of people on Twitter purchased products after exposure to an ad in the last 30 days. Customer service - Almost all established businesses have one or more Twitter accounts that serve as a customer care service. If the company operates in one or more countries, then Twitter accounts for specific countries are used. Appropriate use of Hashtags - Never overuse the number of hashtags on Twitter as some users might find it spammy. You can use inspiration from trending topics and create content based on that. Since social media is all about trending subjects, this might help to gain users attention. Managing tweets from customers - Users express both positive and negative reviews, and both should be handled appropriately. Retweeting positive reviews will increase the brand awareness and helps to establish that the quality of the product or service offered is excellent. Negative tweets should be addressed with proper solutions. You can use the DM feature as they are not restricted to 280 characters. GIFs and polls - Twitter is a great platform to conduct polls and share GIFs. You can browse and use appropriate GIFs by using the built-in GIF keyboard feature provided by Twitter. While posting out a tweet or replying to a tweet, you can use the GIF feature. Using polls not only helps you to understand the customer's point of view but it also in increasing the interaction. Make use of Threads - Posting a status on Twitter is not always limited to 280 characters. With the help of threads, businesses can post a series of tweets one after the other. Since the additional tweets are only visible under “See more” option, this can be used to create useful content that won't overwhelm the customers if they aren’t interested. Pinterest is one of the most useful and significant platforms for showcasing products. Since it is entirely a visual medium, content on Pinterest performs better. Firstly, if your personal account has a set of followers already then switch it to a business account, this is to get features like Pinterest Analytics and Promoted Pins. 61% of the users said that they had discovered new products and brands from Promoted Pins. 52% of Pinterest users say that the platform helps them in buying new products. ❖ Use Keywords - Right keywords should be used in the image description for your image to reach more people. Similar to Google results, the results in Pinterest are based on the keywords used. ❖ Make separate boards on product and service types - Pinterest is all about display and arrangements. Creating a separate board for a product or a category of products can help users quickly navigate and have a look at the products they are interested. The same can be applied if you are offering services. This will also enable users to directly follow and share their favourite boards. ❖ Use Rich Pins - There are four basic types of pins and Rich Pins are useful in providing important information such as product availability and real-time pricing. This can help in making purchase decisions. Another use of Rich Pins is price notifications. If the price of a particular product is decreased, then an email is sent to the customers who have repinned the product. ❖ Buyable Pins - Buyable pins are the best way to make your customers shop without leaving the app. Users can even finish the payment process without the need to switch to another application. ❖ Strictly high-resolution images - One of the basic aspects of an image to perform well on Pinterest is to be in high-resolution. In addition to that, the images must be optimised for mobile phones as well. Since 80% of Pinterest users access the platform on their mobile, customising the images for mobile phones is mandatory. You don't have to create a buzz on all popular social media networks. Do research and find the sites where your customers spend most of their time. Select the top three social media networks that suit the best for your goals. This also helps in maintaining the resources and customers effectively. Businesses should be careful of what they post on social media as one post can affect the business to a huge scale.